Tanner Taguchi (left) shows rolled-up panoramic photos that he flattened for his Eagle Scout community service project. Photos of picnics and other social events from decades past include many JAHSSD members or their parents and grandparents. 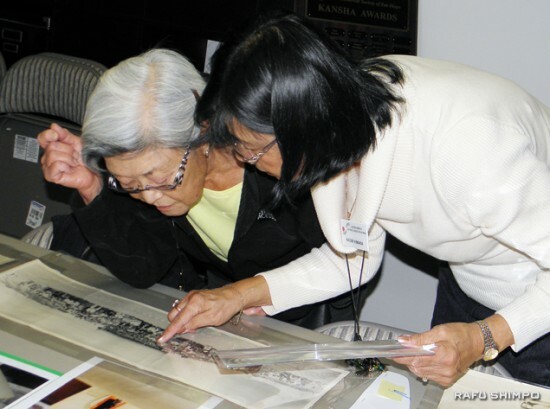 SAN DIEGO — The Japanese American Historical Society of San Diego celebrated its move to Balboa Park with an open house on Feb. 18. Previously located in Kearny Mesa, JAHSSD is now housed in the San Diego History Center, close to a variety of other attractions — the San Diego Museum of Art, San Diego Natural History Museum, San Diego Zoo, San Diego Youth Symphony, and Mingei International Museum, to name just a few. JAHSSD’s new home includes an office, exhibit space and archives containing artifacts and documents contributed by local families. 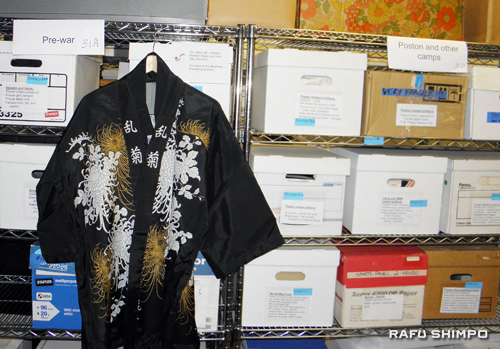 Many of the items were displayed last year during the run of the musical “Allegiance” at The Old Globe. 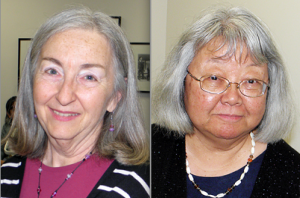 Left: Linda Canada, archivist and past president. 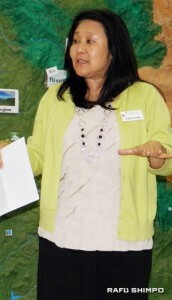 Right: Joyce Nabeta Teague, who is in charge of the newsletter, Footprints. In the gallery were paintings of Fish Camp — a Japanese American village built on two piers in San Diego Bay — by the late San Diego artist Rose Schneider and by former Fish Camp resident Frank Koide, who attended the reception. Koide, whose father, Taju, was a fisherman, was born on Crosby Road and grew up in Fish Camp and on nearby Kearny Avenue. One of his brothers died tragically as an infant by crawling through a trap door that had been left open and falling into the water. In Fish Camp, the trap doors were used to sweep dust and debris out of rooms. 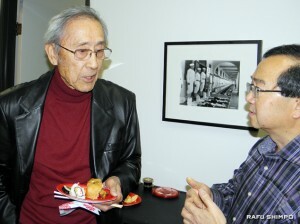 Frank Koide (left) is an artist who lived in Fish Camp before the war. Taju had a boat called the Enterprise, which sank off the coast of Mexico. When World War II broke out, Taju’s second boat, the Magellan, was confiscated and he was sent to a Justice Department camp in Santa Fe, N.M. The rest of the family was held at Santa Anita Assembly Center, then Poston Camp III in Arizona. After the war, the family lived in Pasadena before returning to San Diego. “We heard rumors that there was still a lot of prejudice in San Diego, so we didn’t go there directly,” Koide explained. 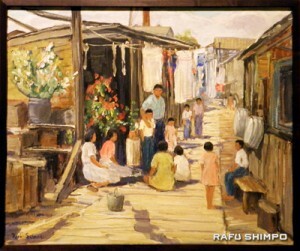 A painting of Fish Camp by noted San Diego artist Rose Schneider (1895-1976) is on display in the JAHSSD’s gallery space. As an artist, Koide specialized in pastel portrait painting, which he taught at Southeast Japanese School and Community Center in Norwalk. His father and his late brother Minoru also had artistic talent as woodworkers. Their handiwork is included in the archives, along with a photo of Minoru serving in the Military Intelligence Service. The open house also featured the work of Tanner Taguchi, whose Eagle Scout project was to make old photos suitable for display. Canada gave him “almost 100 of these rolled-up scroll panoramic photos that stretched from the turn of the century to the ’60s,” he said. “She had this water bath technique already thought up, putting weights on either side of these photos and then putting them above water but not having them touch the water. The moisture would rise up and naturally flatten them without damaging the enamel on the photos. The photos include church and kenjinkai picnics, and visitors pored over them to find themselves or family members. The physical address of JAHSSD is: San Diego History Center, Casa de Balboa, 1649 el Prado #3, San Diego, CA 92101. The mailing address is P.O. Box 22349, San Diego, CA 92192-2349. For more information, call (619) 338-8181, email [email protected], or visit http://jahssd.org/. Left: 442nd RCT veteran Mas Tsuida poses with a cutout of fellow veteran Satoshi Kida, who passed away in 2010. 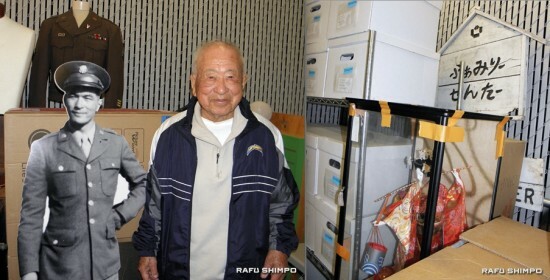 Right: The archives include many items contributed by local Nikkei families. The sign says “Family Center” in hiragana. 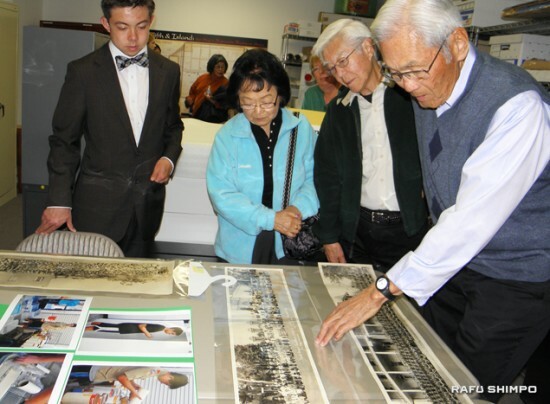 The archives contain files from Poston, Ariz., where many local Japanese Americans were interned, as well as prewar documents. Much appreciation to JK Yamamoto for the photo-filled feature on JAHSSD’s Open House. Our move to San Diego’s beautiful cultural hub was an exciting way to cap our little organization’s 20th Anniversary. It’s also noteworthy that the Rafu is aware of what’s going on waaay down here south of Los Angeles! Thank you!